We have done reviews of many identity protection companies. There are so many features and options, it can be hard to pick just one from all the information provided. We have thought about this problem and we decided to do a review of one of the most well known firms LifeLock ID Protection. The best way to decide what's best is to go through what they are offering in our 2019 LifeLock Review. LifeLock is one of the number one credit monitoring and identity protection services right now. They offer a bunch of great options like daily credit monitoring, social security number monitoring, three different protection plans, fraud alerting and much more. They have won the best Identity protection service award in 2015 by the Kiplinger Magazine. LifeLock is a trusted company has a lot to offer and they have years of experience in the field of credit and identity theft monitoring. The unique feature of this company is that they offer a protection plan that monitors credit on all major bureaus. They also offer monitoring of credit scores, social security numbers, public records and more. So, LifeLock offers a couple of different plans for their clients. These plans differ in price and the protection levels they offer. Their new family options are extremely affordable and they provide protection to all children in your household. On the other hand, LifeLock also utilizes a 5 point protection plan. This unique approach monitors more than a million data points on every client's report through all three bureaus. The very second you become a member, LifeLock begins credit monitoring and identity theft. They also offer children ID protection with the LifeLock Jr. plan for a small fee. If thieves try to get a hold of your personal information, LifeLock will alert you really quickly. The next step is to block all credit cards and bank accounts so that thieves can't tamper with them. When monitoring credit reports, LifeLock provides different levels of access. Some on a daily basis, and some report once a month. Like other major companies, LifeLock offers up to 1million dollars in ID theft insurance which is absolutely essential if something goes wrong. In the case of theft and if damage occurs, the insurance money will cover all costs and the companies will clear your name with the bureaus. Unlike other companies, LifeLock offers deep web identity monitoring. That is very important because most thieves operate through the deep web and that is where they get most of the information. Deep web monitoring will stop them before they even get the chance to use your personal information in any way. They also provide their clients with a free mobile app for iPhones and Android users. That enables them to check on their reports at any given time. 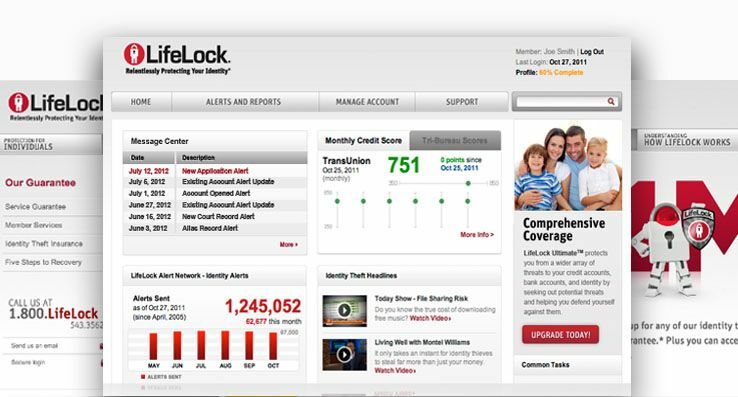 LifeLock also does offer personalized credit analysis tools on their website. LifeLock is a leader in the industry of credit monitoring, maintaining a good name and high client satisfaction rates. Their approach is different in some ways, but LifeLock does their jobs without any issues and most clients are happy with their services.